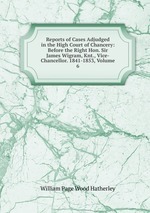 Аннотация к книге "Reports of Cases Adjudged in the High Court of Chancery: Before the Right Hon. Sir James Wigram, Knt., Vice-Chancellor. 1841-1853, Volume 6"